James Dickey, poet and author of Deliverance, a very dark novel about southerners at their worst, once said that Arkansas has thirteen verifiable dialects, making it almost impossible for people from Northern Arkansas to understand people from Southern Arkansas. Unfortunately, more than a few people think that the only things of interest in Arkansas are its perpetually underperforming football team at The University of Arkansas, Walmart and those purveyors of dirty politics at its best, the Clintons. Not so fast my friend! 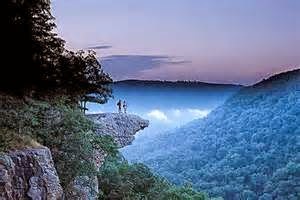 In addition to the incredible geography of the Ozarks, Arkansas can claim one of America's most celebrated architects, E. Fay Jones, as a favorite son. An apprentice to Frank LLoyd Wright, Jones became best know for his poetic interpretation of organic design, which is evident in the many houses and other structures he designed. I had the great fortune to hear Jones speak while in architecture school. Unlike the "starchitects" of today, Jones was a soft spoken, almost humble gentleman of immense talent. In addition to Jones, other cultural icons hail from The Natural State, including Johnny Cash, founder of The Band, Levon Helm, and Oscar winner Billy Bob Thornton. With luminaries such as these, the good people of Arkansas can be proud of their state and its citizens for their contributions to the cultural landscape of the good ole USA. Or Bentonville for that matter. Leaving the confines of Architect Wright's Price Tower skyscraper hotel earlier in the week - the tree away from the crowded forest - and the rather pedestrian environs of Bartlesville, Oklahoma, we enjoyed the easy drive to another time and another place, literally and metaphorically. Check my last post if you want the scoop on the Price Tower Hotel. 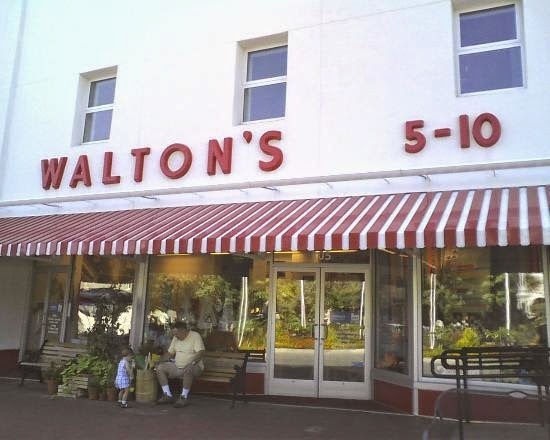 Bentonville, Arkansas - the home of Walmart, the world's largest employer. The following Wikipedia account of the transition of Bentonville from a rural backwater to the corporate epicenter of the world's largest retailer sums up the immense impact on Bentonville and Northwest Arkansas. And yet Bentonville still remains the quintessential small American town, complete with locally owned storefronts, village squares and friendly citizens. However, like any urban enclave with yuppies and millennials around every corner, you can get a nice 20 ounce white mocha latte for a cool $4.75 at the Pressroom, a local coffee/breakfast/brunch/lunch eatery, complete with un-painted concrete floors, exposed galvanized ductwork and funky objects de art. Trendy is as trendy does! There are multiple food choices in Bentonville to please the palette of any discerning vagabond. Our destination in Bentonville was the art centric 21C Museum Hotel. Strategically located in downtown Bentonville, the 21C brings one of the best examples you will ever find of a "concept" hotel to this small community, a magnet for vendors and entrepreneurs from all over the globe. Visionary hotelier Kentuckians Laura Lee Brown and Steve Wilson have embarked on a completely new approach to the boutique hotel. The sleek, minimalist design by Deborah Berke Partners combines with great service and uncompromised comfort to create a truly unique hotel experience for nomads and vagabonds in search of the best. And it doesn't cost a fortune. At $199 per night, our deluxe king, complete with fabulous bed, large couch, table and a massive, subway tiled shower/bathroom, exceeded any standard you would expect in a large urban four star hotel, sans the snooty concierge. The staff at the 21C was fabulous. And to further heighten the "this is a different kinda place" vibe, the owners of this sweet little boutique number decided to insert penguins, lime green at Bentonville, around every corner. According to OurInventionGeneration Blog, the idea for the penguins came as a result of a visit to an art exhibit in Venice where several red penguins were being displayed. Upon noticing positive reactions to the penguins, eureka! The placement of penguins everywhere in the 21C enhances the already unique quality of this hotel wrapped around a vibrant art museum. You can get my take on the Louisville 21C, the first of what will hopefully be many more to come, from my post back in March 2011. For a town of 35,000, Bentonville offers many ways to enjoy a unique blend of commerce, nature and simple small town pleasures. If American art is your thing, then Bentonville is your place. 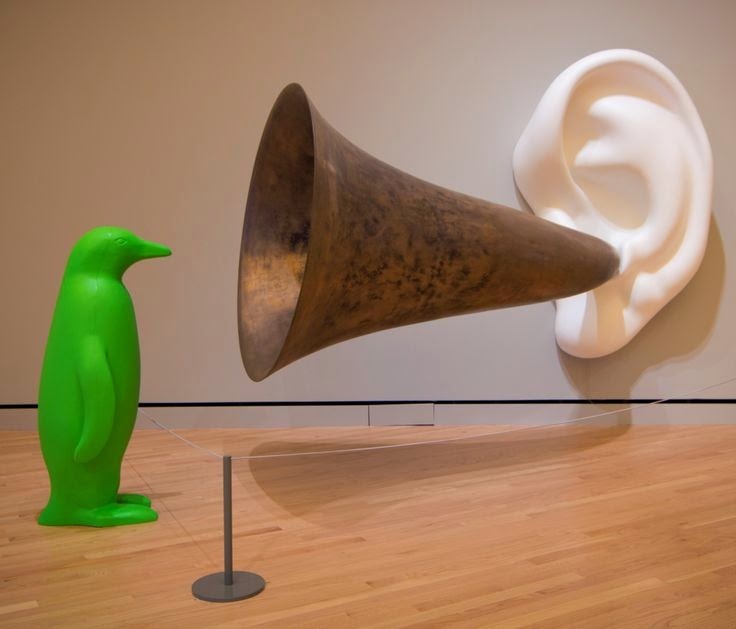 You can enjoy work from Audubon to Warhol by taking about a twenty minute stroll from the 21C to Bentonville's Crystal Bridges Museum, designed by international architect Moshe Safdie. There is actually a designated trail from the hotel to the museum. Funded by the Walton family, with a collection estimated at $488 million, this world class museum, with its sweeping curved metal roofs, polished concrete and locally harvested wood is designed to create an exceptional experience surrounded by innovative architecture and art. And get this - It's free! That's right, due to the Walton endowment for operational costs, the museum is completely free to all. Though lunch in the glass walled restaurant, Eleven, is a bit pricey, it's a small price to pay to enjoy world class art for free. Finally, a stroll down one of the many art laden paths through the Arkansas woods is a great way to end the day for vagabonds desirous of enjoying nature and art at its best. And after wandering around Bentonville or visiting the Crystal Bridges for an art filled afternoon, dining in is the recommended choice - The HIVE. This well appointed eatery showcases a unique blend of locally grown everything, which has come to be known, in some circles, as High South Cuisine. And do not skip dessert! As they say in some parts - It don't git no better! So the next time you want to get away, enjoy the sites and sleep and eat like a Nomad who refuses to settle, a trip to Bentonville will scratch that vagabond itch. And it won't break the bank. Next up - The ultimate side trip that brings architecture and the meaning of life into focus like few other places. Video Artist of The Week - The son of an Arkansas farmer, he started out as the drummer and lead singer for The Band. Later in life, he became one of those voices that cuts through all the junk and makes you think about important things, better thing. Which he was still here - Levon Helm.